Wave makes it easy to let other people help with your accounting. You can grant access to a trusted individual — an accountant, bookkeeper, tax preparer or business partner, for example — by inviting that person to be a user. 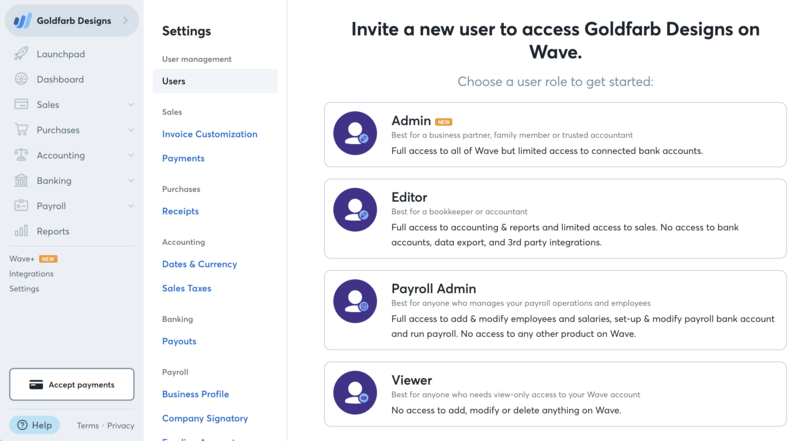 If you'd like to add a user to help you run payroll, but restrict them from accessing the rest of your Wave account, add them as a Payroll Manager. You add a user separately for each business. Multiple businesses in Wave are controlled separately. If you'd like someone (an accountant, for example) to have access to more than one business, you will need to invite them separately for each business. Click Settings at the bottom of the lefthand navigation menu. Click on Users under User Management. Click the panel to invite a viewer, editor, admin, or payroll manager. Add their first name, last name, email address and their position with your business. Click Invite User. Remember, you are granting access to sensitive information, including a history of all your bank and credit card transactions. However, your online banking passwords will NOT be available to the user, since this is saved separately from your accounting information. If the user does not have a Wave account, they simply enter their email address and a password. Then, they will need to select a personal currency. This is because your user will now have their own Wave account, which includes a personal profile. If the user is a current Wave user, they will need to click the Add link at the bottom of the email. On the User Management page, you will now see the pending invitations. The person you invited will receive an email inviting them to your access account. If you would like to terminate your user's access, go to the User Management page and click on the trash icon beside the user's name. You will be asked to confirm the deletion of this user. To edit user access, click Edit next to their name. Change their user type by clicking the button next to the type of access you'd like to change them to, and click Save.